ConceptDraw DIAGRAM is the design software with the vector stencils, examples, and templates set for drawing different types of diagrams. 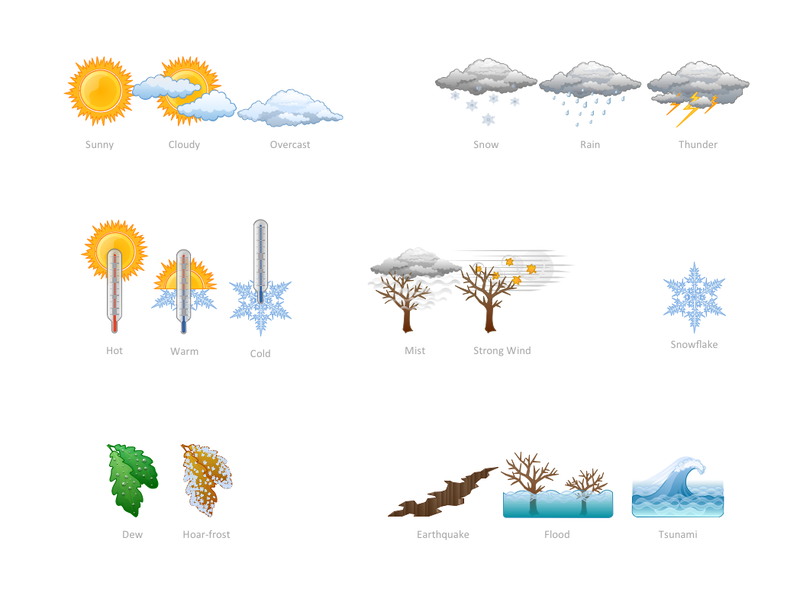 Nature solution as a part of this software includes various, colorful vector clip art that everyone can easily use for illustrating weather condition. Pic.1 Weather - Design elements. Nature solution extends ConceptDraw DIAGRAM software with samples, templates and libraries of vector clipart for drawing of Nature illustrations. Use Weather library of vector stencils to illustrate weathering activity. Nature solution expands this software possibilities to create beautiful illustrations diagrams with the new library which contains 17 vector objects.